So, we needed a better way to keep an eye on our Spiceworks helpdesk tickets. I’d seen Geckoboard around, and decided to have a look into it. What sold it for me was the fact that Geckoboard have a Push API that would allow me to push data to the dashboard widgets, thus avoiding the need to create some sort of webservice that I have to open ports on the firewall to. The other thing with a webservice is that it’s usually run with compiled code, which isn’t as flexible to maintain or for other team members to pick up. The Geckoboard Push API uses JSON, which is easy to work with in PowerShell. I’d already worked on getting data out of Spiceworks using PowerShell for my email reports, so I had that part of it covered also. The rest was just a matter of wiring together the right queries to extract the data that I wanted to monitor. The prerequisites for this are the same as in the previous blog post about Spiceworks and data extraction; .NET 4.5 & WMF 4.0, and the SQLite PowerShell Provider. Add a custom widget of your choosing. The documentation for each widget describes how the JSON data should look. Make sure you set its method to Push, and grab the Push URL and Widget key whilst you’re at it. These are used in the script in step 4. Work out the SQL query that you need to extract the data. See this blog post for how I normally do it. Run the script in a scheduled task to push the data to Geckoboard. Since there is one script per widget, I’ve currently got 14 scripts. What I’ve done is created a wrapper script that contains common code. This script then goes and runs all of the widget-specific scripts. The wrapper script is the one that I run in a scheduled task. Ours runs every minute. I can provide code for the other widgets if anyone’s interested in implementing a similar solution. We’ve been running this for over 6 months now. It’s a great way of keeping on top of the helpdesk workload, and making sure that everyone’s delivering the service that they should. I’d be interested in seeing your other scripts. You did a great job on the dash board btw. Are you availible for hire to help create some custom reports via email or dashboards? If so whats your hourly rate. Thanks for the helpful blog! That’s not really something I do. Sorry. Understandable. Would you mind sharing the code for the 12 other PS scripts you use with Geckoboard? Definitely. I’ll put them up online as soon as I get the chance to review them. I’m quite busy at the moment. Hopefully in the next week or so. Would also love to have the other PS scripts! 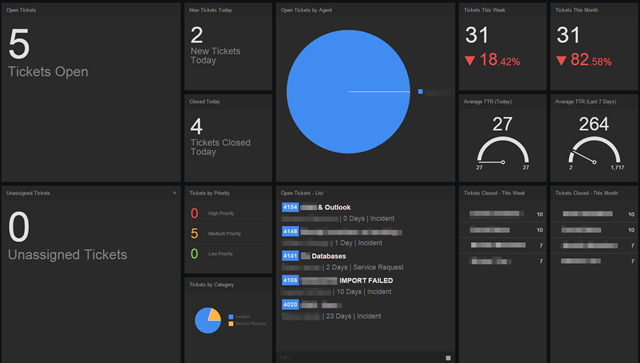 That dashboard is exactly the data i’d love to “hang” on our door/TV. When time permits, would you mind sharing the other PS scripts which pull the data on your board? 4. Open Update-GeckoBoard_Spiceworks_Dashboard.ps1 in the PowerShell ISE and run it. Any errors from the “sub scripts” will appear in the output pane. I’ve included the custom widget type details in each of the sub scripts, just so you know what to set up within your own Geckoboard instances.